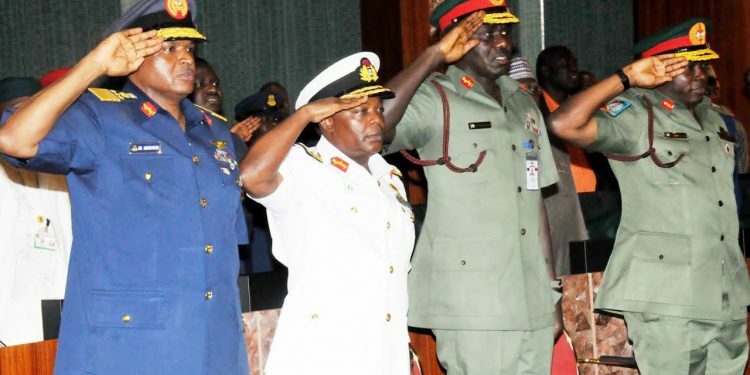 The leadership and members of the Northern Elders, Professionals and Stakeholdersâ€™ Forum (NEPSF) have faulted the recent call for the sack of service chiefs by the pan-Yoruba socio-cultural group, Afenifere. The group asked President Muhammadu Buhari to ignore the recent call, stating that some political enemies have infiltrated Afenifereâ€™s ranks. National President of the group, Chief Simon Shango, in a communiquÃ© after a stakeholdersâ€™ meeting, on Sunday, mourned with President Buhari over the recent murder of some soldiers in Melete, Borno State. Shango, a former editor of Daily Times Newspapers and Publicity Secretary of the NPN, lauded President Buhari for his efforts to restore peace to the nation. According to Shango, â€œThere is no doubt that these soldiers died for us to live and we are optimistic, the supreme price they paid for Nigerians and our fatherland would not go in vain. â€œAs we mourn their sudden passage to eternity, we pray Almighty God to grant their gentle souls peaceful rest in His bosom as well as comfort the nation. â€œWe consider it another rare compelling reason for us to scribble these few lines to you. â€œThough, you are still in mourning mood, but we are also stimulated by the prevailing tragedy which befell the nation to empathise with you. â€œIt is completely unnecessary to repeat what is already known to you and millions of Nigerians. â€œBut for the sake of emphasis, let us remind you about some of the issues which have already come to your attention. â€œIt belittles reasoning and sense of patriotism that ethnic bigots, enemies of Nigeria, political charlatans, particularly, the opposition elements in Nigeria to so bizarrely seek to use the deaths of our soldiers in the hands of our mortal enemies as campaign weapon to fester their political nests. â€œIt is against the precepts of morality and spirit of fraternity or commiseration for families of the slain soldiers. â€œWe perused some of the recent outbursts, the latest emanating from Afenifere, the Pan-Yoruba socio-political group. â€œWe disappointingly discovered to our dismay that these anti-Nigerian forces may have infiltrated their ranks,â€ the communique read. It added that the agenda to lend supportive pillars to the atrocities of Boko Haram terrorists through media propaganda is only deemed complete, when their internal allies intentionally disparage the Presidentâ€™s laudable efforts to contain these religious extremists bent on violent occupation of Nigeria. The group said the pro-Boko Haram disposition of the tribal associations, manifested more glaringly in the communiquÃ© issued by Afenifere after its monthly meeting, which took place in Akure, Ondo State at the house of its leader, Pa Reuben Fasoranti. Shango continued, â€œTo say, we were shocked that the Afenifere enlivened the campaign for the sack of the incumbent Service Chiefs is to put it politely. â€œBut the infusion of a political tone into an otherwise mournful comments by praying God to â€œâ€¦give us a leadership that is more than equal to the challenges we face. â€œThis is not a platform for us to engage the elders of Afenifere on a battle of words; but suffice it to say, their remarks were uncharitable, unpatriotic, misplaced, mendacious and grossly leading. â€œThe comments are condemnable and a tacit bolstering of the terrorists triumph and burgeoning to rise against our nation in pseudo might. â€œThatâ€™s why they freely quoted unofficial and inflated figures of casualties of soldiers in the Metele attacks,â€ the group added.